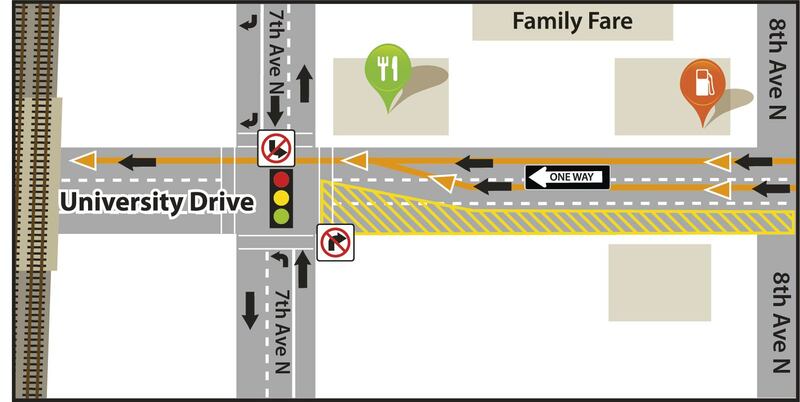 Tomorrow, November 14, the 6th Avenue N intersection and 10th Street North railroad underpass will open to drivers. Beginning Wednesday afternoon, 10th Street N from 4th – 12th Avenue North intersections will open with a single northbound only driving lane on west side while crews complete work in the boulevards. On University Drive all driving lanes will return to southbound only south of 7th Avenue N once crews reinstall permanent traffic control by the end of the week. When project enters winter suspension, the second driving lane on 10th Street N will open to motorists. To continue north on 10th Street N at 4th Avenue N intersection, continue straight on 10th Street N thru the traffic signal. The detour route is removed from using 4th Avenue N to access northbound travel on University Drive. To continue north from 7th Avenue N and University Drive intersection, continue east on 7th Avenue N and turn left at the traffic signal at 10th Street N. The detour route was removed from using University Drive for north and south travel. No left-turns are found on the traffic signals and road closed barricades warn drivers. All bike and truck traffic detour routes have been removed. A marked bike lane is open on west side of 10th Street N.
The remaining project work is anticipated to take eight weeks and will start after North Dakota State University spring semester is over in May 2019. The scope of work will be to complete roadway improvements under the railroad underpass and complete the city utility tie-ins. There are two remaining traffic control phases to complete the project next year. A head-to-head detour on University will be in use to accommodate work in the underpass. 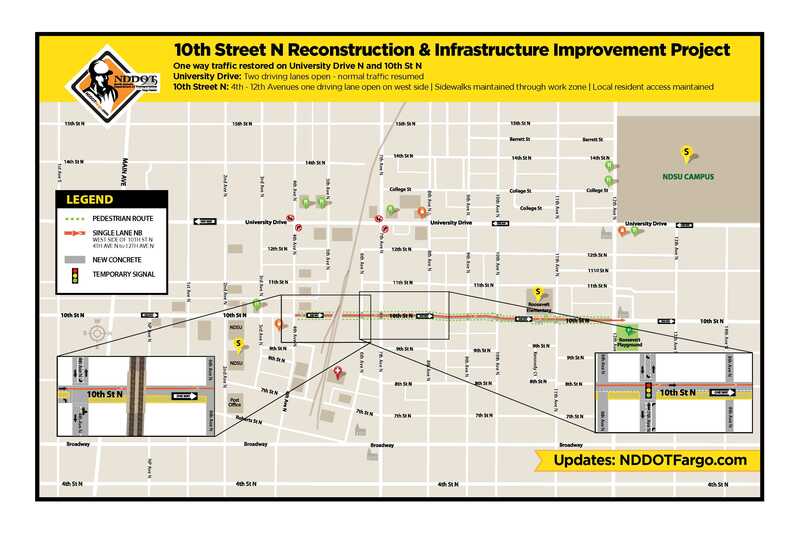 The detour will be shortened significantly from 2018 project limits and in-use for five of the eight weeks of work Planned detour will route northbound 10th Street N traffic to University Drive to be carried head-to-head with one driving lane in each direction between 4th Avenue N – 7th Avenue North intersections. All other one-way northbound traffic will remain on 10th Street N.